The Heat seem to have an answer for everything the Pacers can come up with, and that may cement Indy’s legacy. The Pacers are at risk of becoming one of those teams people remember as a character in another team’s story — the underdog full of aspiration that tests a champion, pushes it to be legendary, and fades into a victim’s role on that other team’s highlight reel. The Pacers are young, but they appear to have reached their ceiling as the only Eastern Conference team able to mount a consistent year-to-year challenge to Miami’s greatness. The Heat destroyed Indiana over Memorial Day weekend, dominating on both ends of the floor, and they now stand one win away from their fourth consecutive trip to the Finals — a feat no team has accomplished since the 1980s Celtics. The Heat have held the Pacers’ offense in check since Game 1, and they defend Indiana in a style that would have been unfamiliar to the Heat of 2011 and 2012. Those Heat blitzed everything, trapping point guards out toward midcourt on the pick-and-roll and rampaging around the floor like uncoiled sprinters. 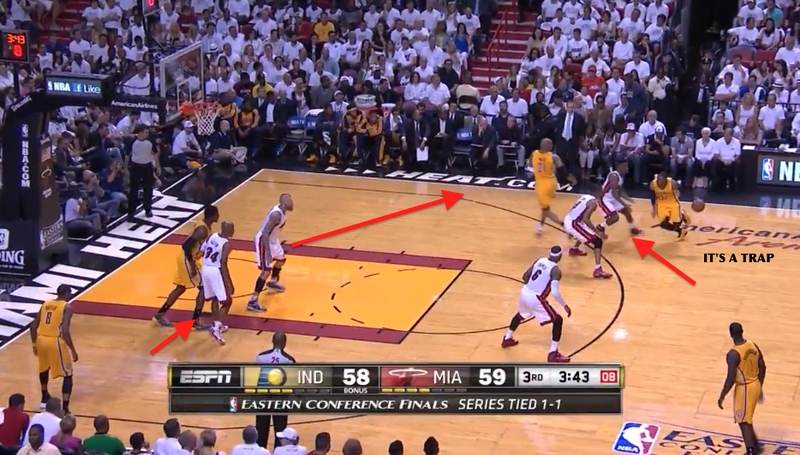 The Heat have had their big men drop back on the pick-and-roll or slide side to side at the level of the screener. It is damn near conventional NBA defense by a team that has been unconventional in almost every way since Pat Riley constructed it. There were lots of reasons for the adjustment, including the coaching staff’s recognition that playing hyperactive defense wore down an aging team. But Indiana really coaxed the change. It punished Miami’s traps by having its screeners slip down toward the foul line before even really setting the pick, allowing Indiana’s ball handlers to loft easy entry passes ahead of the Heat’s traps. 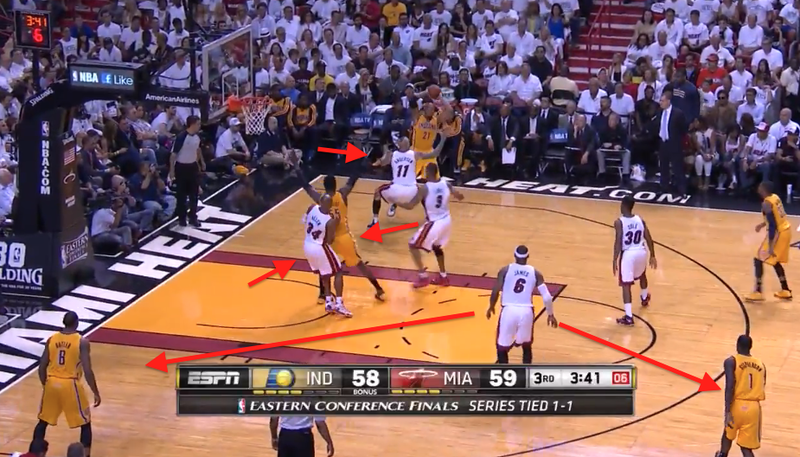 David West would catch the ball and move right into a 4-on-3 situation, with the Heat’s trapping defenders scrambling to catch up. The Pacers never really lit up the Heat this way, but they did enough damage to stay close, with West driving for hoops and whipping the ball around to open shooters. And so the Heat swallowed hard and dialed back the trapping, shedding what had been a core part of their identity. The change has neutered the Pacers’ pick-and-roll attack from the center of the floor in three consecutive Heat wins. The Pacers have no one who can turn the corner, and without a hard trap to exploit, the Pacers’ ball handlers have too often just dribbled aimlessly toward the sideline. That is death against Miami, which feasts upon weak cross-court passes. Indiana’s huge lead in Game 3 vanished under an avalanche of turnovers along the right sideline. “You just gotta tip your hat to Spo [Erik Spoelstra] for that,” Hill told me at shootaround on Monday. “He changed the way they defend us.” Hill said he took no pride in forcing a concession from the champs. Over their last three games, the Pacers have scored 0.69 points per possession when a pick-and-roll ball handler finishes the play,1 per Synergy Sports. That would have ranked dead last in the league, and Indy coughed the ball up on 41 percent of those possessions — a number so huge, it is almost hard to believe. Synergy Sports defines such plays as any time a ball handler in the pick-and-roll ends the play with a shot, drawn foul, or turnover. The Pacers haven’t been completely helpless. They have been able to find the roll man at a healthy rate, and good things happen when they do that. They also shifted a ton of pick-and-roll action toward the left side of the floor, clearing their three other players to the other side of the court. That is where they face the remnants of Miami’s trapping heyday. 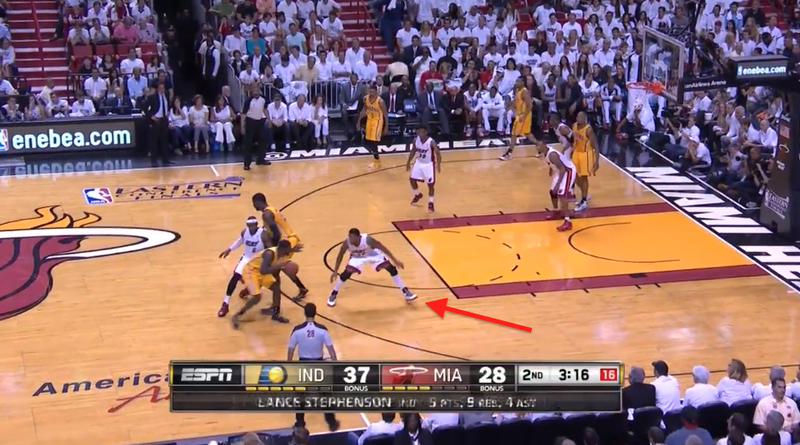 The Heat still blitz pick-and-rolls along the side of the floor when the ball handler is dribbling toward the middle. They want to force that ball handler backward, making him pass against his body’s momentum — giving Miami’s defenders behind the play time to rotate in chaos mode. Indiana has used that action to generate those old 4-on-3s, and this series often feels like it will come down to which team wins those mini-battles. Over four games it has been Miami, with bursts of near-perfect defense that combine manic energy and precision. 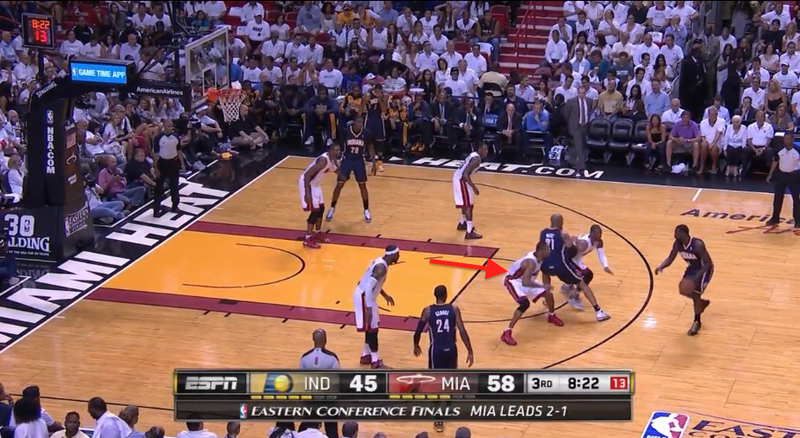 The Pacers also turned to this in part to break Miami’s full-court pressure. The story of the series has really been on the other end, where the Heat have sliced apart the league’s best defense. Miami has scored 111.5 points per 100 possessions in this series, a mark that would have easily led the league in the regular season. It has been deadly almost any time it has played with just one traditional big man on the floor, reaching full fireball status in Game 4, when Bosh broke a streak of miserable games against the Pacers. Miami showed the full power of the small-ball identity it discovered two seasons ago in the conference semifinals against these same Pacers. Indiana did nothing to push that change upon the Heat. The Pacers were bystanders as Bosh suffered an abdominal injury in Game 1, and they had little reason to suspect a revolution was coming in Game 2, when the Heat started the double-big duo of Udonis Haslem and Ronny Turiaf. But in Game 3, things changed: Miami started Battier at power forward and Dexter Pittman at center. “Maybe the worst playoff frontcourt in recent memory,” Battier said, laughing, on the morning of this year’s Game 4. The Heat have struggled to fill the Battier role. Also, Mike Miller is gone — a casualty of an amnesty provision the Heat would have used on Joel Anthony had they based the decision on basketball. Michael Beasley has been a disaster, as immature and defense-phobic as ever. The Heat get by at times going super-small, with no one in the Battier role as a co–power forward with LeBron. They pulled away in Game 3 behind a Norris Cole–Allen–Dwyane Wade–LeBron-Bosh lineup, with Allen drilling a flurry of 3s as poor West tried to chase him around the floor. They barely used that lineup in Game 4. These Heat have to scrap. Cole’s ability to defend Lance Stephenson enabled the Heat to use that lineup, and freed them to play Allen as much as his body could handle. Miami could hide Allen on Hill instead of worrying Stephenson would brutalize him, and the matchups fell into place from there. Cole sparkled in his first two weeks as a pro, but the Heat knew he wasn’t ready to be a reliable offensive player. He couldn’t shoot 3s, a must for any Heat guard playing off LeBron, and he was out of control with the ball. Cole made awful decisions in transition, and when he ran the pick-and-roll, he just barreled full-speed into the lane. Craig and Cole would watch film together, with Craig queuing up “at least 100 or 200” of Cole’s mistakes in the lane and in transition. They’d augment that by rewatching some of Cole’s good plays, and splicing in film of players who might serve as models — Tony Parker, Steve Nash, and even a young Dwyane Wade. “Back when he was handling the ball a lot,” Cole said. They reconstructed Cole’s shot mechanics from the bottom up — balanced feet first, then a higher release point. There is some noise with those numbers, as there is for any small sample. Cole in particular gets to benefit from coming in right around when the first of Indiana’s starters leaves the floor, and the Pacers are mostly bad when any lineup but their starting five plays. LeBron has been his usual brilliant self against Indiana, and everything is easier for him when the Heat maximize spacing by playing just one big man. It was unclear where the Heat would find that spacing in Game 3 until Spoelstra dusted off Rashard Lewis — a possibility the team’s brain trust had been kicking around during the three-day break after Game 2. Lewis came to Miami as damaged goods, riding out a weird career that started with him as the weeping teenager waiting in the green room for someone to finally draft him. He thrived as a dynamic wing player in Seattle before signing a ludicrous maximum deal with Orlando and turning into a stretch power forward with killer 3-point range and a quirky release. That release is too slow for Lewis to be much of a threat anymore. “I got these old bones now,” he said. “I gotta get more legs into it.” He missed all his shots over the weekend, but he can credibly stand in places where Haslem and Andersen can’t. Lewis spends a lot of time chilling in the corner, and he can work as a pick-and-pop guy for LeBron — a nice way of attacking Luis Scola, whom the Heat have gone at almost cruelly. The Pacers should probably be ignoring Lewis, but reputations die hard, and it’s tough to tell players midseries to scrap the way they’ve been defending all season. Lewis can’t really guard West, Battier’s old job, and one at which LeBron failed horribly in Game 1. West can bully Lewis for post scores and draw double-teams. But Lewis has fought hard enough that he’s not an unplayable weakness. He’s fronting West down low and denying him the ball at the elbow, even frustrating West into a shoulder-block offensive foul in Game 3. He has been a key figure in Miami’s surge, and that was not something Lewis expected upon landing with the Heat last season. Lewis really shouldn’t be a central player on any title contender, and that he is highlights the fragility of this incarnation of the Heat. They have been inconsistent, even within games, a reminder that they took the notion of flip-switching to a near-untenable extreme last season against the Pacers and Spurs. But they put together about 70 minutes of exhilarating ball this weekend against Indiana, unleashing the kind of targeted rampages that make it seem like they will never lose again. The team knows it needs to find that gear more often in this postseason, especially if it makes the Finals. Its peak isn’t quite as high, the roster not as deep. The Heat cannot get by on summoning unbeatable effort only when they are tied or behind in a series. Producing points against Indiana hasn’t been easy, even if the results make it look that way. The Heat have to mix things up, reaching back to classic Miami sets, peppering in new tweaks, working against Indiana’s expectations. “We have to go deep into our menu,” Spoelstra said. They ran Bosh off pin-down screens, rare for a big man. Critics will read this as softness, but they’re wrong. Bosh is playing the way Spoelstra wants — a style that confounds traditional big men and leaves the block for Wade and James. The Heat reserve post-ups for their best passers; post plays draw double-teams, and you might as well leave the reading of those double-teams to the smartest assist guys you have, especially if they can operate without a big man nearby — thanks to Bosh. Most intriguing: Miami has gone right at Hibbert in this series, more than it did last season, when the Heat preferred to stash Hibbert in the far corner. They’ve put him directly in pick-and-rolls by having his guy set the screen, and then risked having James, Wade, and even Cole and Mario Chalmers attack Hibbert on drives. 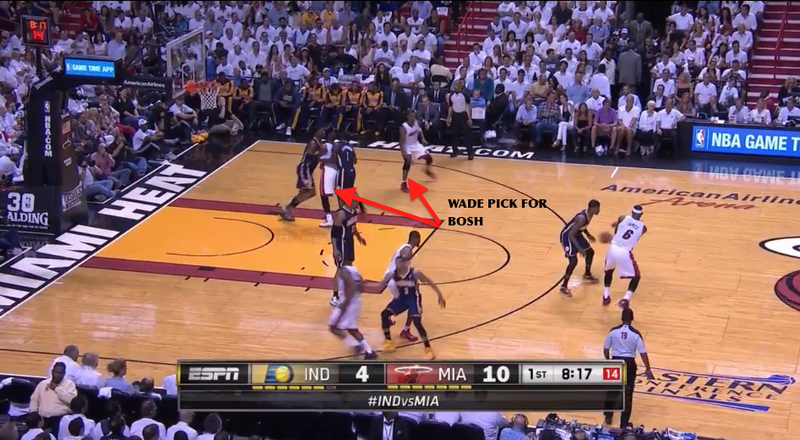 Wade has reminded everyone what an artful midrange player he is. James has raced Hibbert to the basket, and even revived the floater he famously unveiled as a Hibbert-only weapon in 2012 — a shot he largely scrapped last season. Hibbert doesn’t like to challenge those midrange floaters, preferring to protect the basket and prepare to box out. But the Heat have made him pay. The Heat, at least for one series, have solved Hibbert. They have scored just as well regardless of whether he has been on the floor, and dramatically better with Hibbert playing over the last three games, per NBA.com. Miami has mixed things up just enough to keep Indiana off balance, and it has gotten out in transition about as often as it did in the regular season, per Synergy Sports. 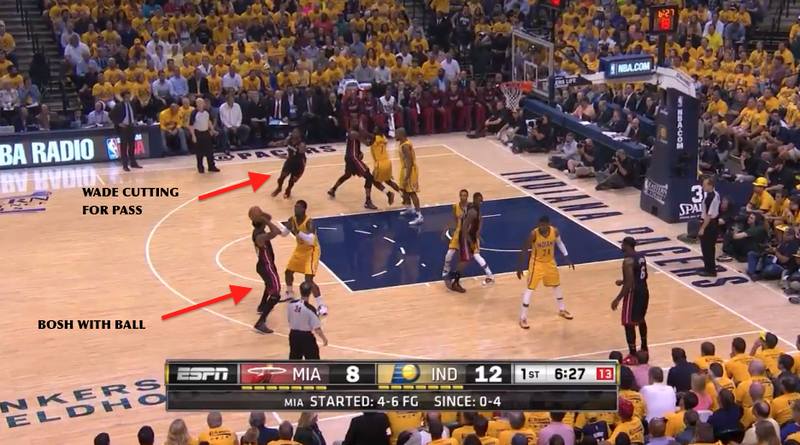 They’ve also hurt Miami on baseline and sideline out-of-bounds plays, with the Heat weirdly behind on some of them. They just don’t really have the playmaking or scheme to sustain offense. If Indiana wants to seriously challenge Miami going forward, assuming the Heat reunite for at least one more year, it will have to do the hard offseason work of revamping the offense — adding more spice, more continuity, and perhaps a new player or two who can dribble. It’s easy to say the Pacers’ bench just stinks, and Indy’s indomitable starting five is indeed plus-12 in what appears to be a lost series. But the starters can’t play 48 minutes together, and the Pacers are too fragile to survive even one or two of them sitting. That’s not necessarily on the bench crew, which is underwhelming. But so are most benches, including Miami’s. It’s just easier for bench guys to look good when they get to play with LeBron and Wade. But the Pacers have been rigid in their rotations. The Heat have a harmless offensive player in the game at almost all times, an open invitation for Frank Vogel to try Chris Copeland. Vogel hates removing Hibbert from the game against Miami, fearing it opens the rim to LeBron, but when he feels in desperate need of scoring, he prefers the West-Scola duo. But Scola can’t shoot 3s, and he isn’t much better defensively at this point than Copeland. Vogel finally tried Copeland during garbage time of Game 4, but there’s no point in goosing the offense then. It’s too late. If you think Copeland can help lubricate a gummy offense, try him when you’re down by nine in the third quarter, not when you’re down 23 in the fourth. There are so many interesting characters in this series. Take Scola. It has been a rough couple of years for him. He was in the aborted Chris Paul trade before Houston amnestied him, and he has been a bit of a disappointment in Indiana. The Suns straight-up robbed Indy in the Scola trade, even if the teams approached the deal with opposite priorities. But Scola is a true basketball character, a superstar on the international stage for the legendary Argentina team that dethroned Team USA early in the 2000s. Teammates and coaches revere him. Battier cited him this weekend as one of his favorite teammates, and Daryl Morey said Kevin McHale is still asking if the Rockets could reacquire Scola. He is also Exhibit A that being a bad defender is not the same as being soft. Stories of Scola’s toughness are legend. When the team’s doctor concluded it was too dangerous for Scola to play with an eye injury in 2009, Scola went on a rogue search for one doctor, any doctor, who would clear him, Houston officials recall. When trainers ruled Scola out after an in-game knee injury in New Orleans, Scola tried to check himself into the game anyway. The coaches pulled him back, but he tried to slip into the game again a few minutes later. Evan Turner is another fun character to watch. He’s the no. 2 pick from the 2010 draft in a contract year who just kind of sits there and observes everything with a weird smile on his face. He even wanted to ditch the team bus after one practice and walk home alone; he asked me how long the walk would be to his hotel. The no. 2 overall pick: just here for support, like Bob Benson. • Miami fans get some deserved criticism, but the crowds for Games 3 and 4 were outstanding. The arena was filled before tip, and the fans were loud. The Heat’s in-arena production value is strong. I love the way Michael Biamonte, their public address announcer, says Mario Chalmers’s last name in a “CHALM-ERS” sing-song, and playing “In the Air Tonight” as the players mill around before tipoff is a genius touch. It produces a vibe of focused intensity as Wade runs around the court, urging different sections of the crowd to cheer. • Miami’s JumboTron video montage priming the starting lineup intros features an unusual amount of player shirtlessness. It mostly consists of shirtless Heat players slamming sledgehammers into tires, pulling ropes, and screaming in what appears to be an abandoned steel mill. • I would estimate that at least 40 percent of the world’s luxury cars are in Miami. I have never seen so many Lamborghinis and Ferraris in any condensed space. • The Heat own Coconut Grove. You cannot walk 50 feet in that neighborhood without bumping into a Heat staffer, including a genial Spoelstra. • The city of Miami did not disappoint in being a surreal scene like few others in the NBA. About 15 very tall women walked into my hotel early Friday night, an army of blonde models in formation like Leo DiCaprio’s stewardesses in Catch Me If You Can, leaving guests to wonder what was going on. The answer: They were with Tommy Hilfiger, the actual person, for some sort of function. Hilfiger was also at Game 4. I didn’t recognize him, because I am the sad sort of person who would recognize Phil Pressey before Tommy Hilfiger. • The Heat’s championship banners show the Larry O’Brien Trophy with the word “CHAMPIONS!” underneath it. The exclamation point cracks me up for some reason.